The Abbot of St. Albans was granted a Charter by the king in the twelfth century to hold a market weekly in the town. This would have included the sale of livestock as well as a general market. It was held in the market place, the area adjacent to St. Mary’s church where the High Street widens, until 1928. It then moved to a site which is now under Charter Place, where it remained until 2014 when it was moved to its current site near the flyover. This page was added on 07/06/2015. My earliest recollection of Watford Market is during the early 50’s on shopping trips from Pinner where we lived before moving to Watford in 1961 to run a general stores on the corner of Vicarage Road and Hagden Lane. A lasting memory of the Market is the fish stall by the Cawdells side exit selling live eels and the eels trying to escape from shopping bags. Did A.Clark have a butchers business? 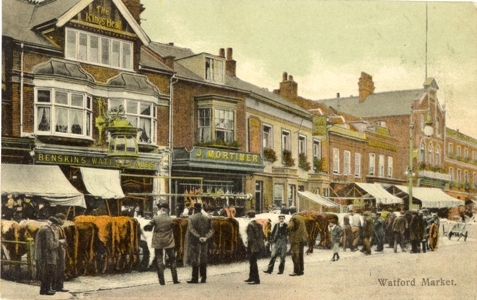 I have a very old postcard of a butcher in a horse drawn cart with the name A.Clark Butcher Watford on the side. I just remember Watford’s market, being pushed in a pushchair through an arcade leading through to it from Cawdells corner. My grandmother bought fruit and veg there. There was a tall woman with long black hair that almost reached the ground, simply standing there for people to see. The arcade had a lovely acoustic for a small child trying out her voice! Was not Watford market covered? It was in the fifties. Mummy bought dress materials there. And behind was Grillo\’s ice cream, scrumptious! I worked on the market in the late 50s for B A Clark & Son. The business was run by Arthur Clark (the Son – the father being long deceased). At that time Arthur had a small nursery in Clarendon Road a couple of hundred yards up from the high street almost opposite Beechen Grove which at that time was a gravel car park. He also had a larger nursery at Rickmansworth and latterly acquired some land from Sanders Orchids in Hempstead Road (between Grove Mill Lane and Hunton Bridge) which is now a very large Garden Centre. A day on the market would start about 7.00 am loading a two wheeled double deck barrow with plants and cut flowers from the Clarendon Road premises and wheeling it through Beechen Grove through the back entrance to the market to Arthur’s pitch. We were not allowed to wheel through the Arcade (which ran from Beechen Grove to the High Street emerging by Cawdell’s) so had to battle our way through the aisles where all the other stallholders were similarly trying to set up. Arthur had three adjoining stalls so it took several barrow loads to stock it. No easy task as the cut flowers were all stood up in galvanised cans full of water; so quite heavy! I remember lunch at a little cafe across the High Street behind the public conveniences and the pub (The Eight Bells? ), The market traders had concessionary rates (1/- per lunch – 5p) and their own separate dining room down a couple of steps at the rear, furnished with one large refectory type table with forms each side. Can’t recall the names of too many of the personalities of which there were many. One in particular I recall (because her stall was on the opposite corner to ours) was Lila Cook of L Cook – greengrocers. Her banter cheered up many a slack moment. At the end of the day of course everything had to be cleared away back to Clarendon Road. All for the princely sum of 7/6d (37.5p ) for upwards of 12 hours work i.e about 4p/hr. I moved to the Oxhey estate in 1948, went to Clarendon and Watford was, then, a beautiful market town. Saturday morning pictures, the smell of ground coffee near the church which had a fig tree growing from a tomb. Moved to Oz in 1961, married ex-Oxhey boy that year, and our return trip to Watford was utterly disappointing -The history had virtually been wiped out! So sad what happened at the pond end and the crossroads which used to be so picturesque. We moved to south oxhey from Bromley in 1947. When I left Clarendon School in1959 I worked at various places of which, Keens sausages & pies factory, BBC ( British Beef Co slaughter house off of Market Street, Victor Value super market opp High street station, Fred Barkers mobile shop, vicarage road, Watford steam laundry and Mark Anthony poly bag factory, Bushey Arches, Postman and then GPO Telephones. Married Janet midwinter 1968 and bought house in a village in Northamptonshire. Loved growing up in South Oxhey and Watford. Henry Boyce. I remember’Henry’ at Brown’s the greengrocer. ‘Henry’ was as equally well known as Brown himself. I can even remember him and his music group playing for the Residents of Mencap Hillside,at Table Hall, Pinner Road, Bushey. The Residents loved him. Brown’s had a shop in Capel Road & Bushey High Street as well as Watford Market. Watford Market situated in Market Place, closed in 1928, The Cattle Market was moved to Stones Alley in Market Street, and the Sundries Market, Greengrocers, Butchers, Fishmongers, clothing etc., was transferred behind Cawdells. I frequently visited the Cattle Market at Stones Alley, during my lunch period, as I went to Victoria School situated in Victoria Passage off Addiscombe Road, not far from the Market. The Cattle Market closed in December 1959, and the site was redeveloped, Stones Alley was then renamed, and is now called Wellstones. I was born in 1946 and I remember a livestock market up an alley beside the old Crown Post Office in Market Street – probably early fifties. Looking at recent maps, it appears this was off what is now call Wellstones – behind the Market Street shops. Could it be the site of Barratt Homes’ carpark? The pigs and sheep you saw unloaded were probably for the Keen’s Sausage Factory which was located in two buildings. One on the corner of Marlborough Road and Exchange Road and one on Exchange Road opposite. I lived in Radlett before moving to Watford in 1961 and there were never animal sales in the High St art that time or since. I am sure there were still livestock sales in the High Street in the early ’60s. I definitely remember pigs and sheep being loaded and unloaded from lorries behind the Sir Robert Peel in the early ’60s. As a small child (I was born in 1943) I have memories of there being a cattle market and slaughter house behind the old fire station. The Roslyn Road car park now stands on the site.